This page may be accessed by secure HTTPS protocol as https://hamiltonlabs.com/Demo.htm. 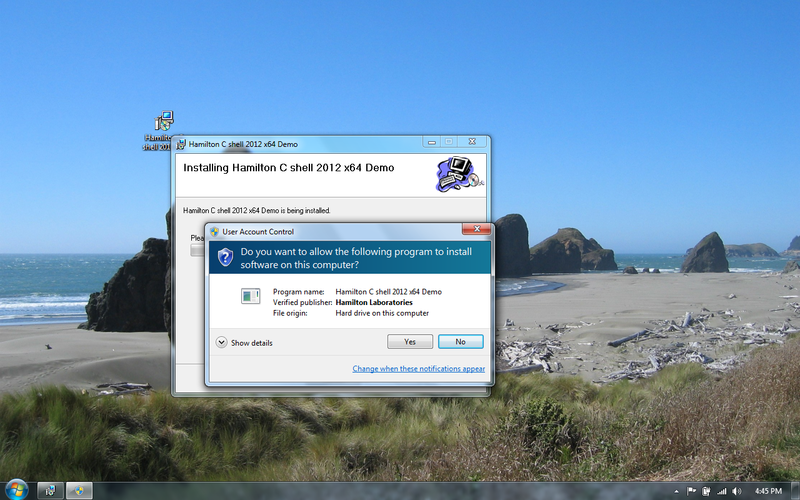 Click below to download either the 32-bit or the 64-bit version, then click on the file to start the installation. These files are release 5.2.f, built October 31, 2016. The 64-bit version requires 64-bit Windows but is a bit faster than the 32-bit version and avoids having to run under the file system redirector Windows uses when running 32-bit applications on a 64-bit system. Both the 32 and 64-bit versions can be installed side-by-side on a 64-bit machine. We sign our install files for your security, assuring you they’re authentic, came directly from us and that they haven’t been hacked to insert a virus. The product is well-behaved: If you decide to uninstall it, it removes cleanly through the control panel in a few seconds. 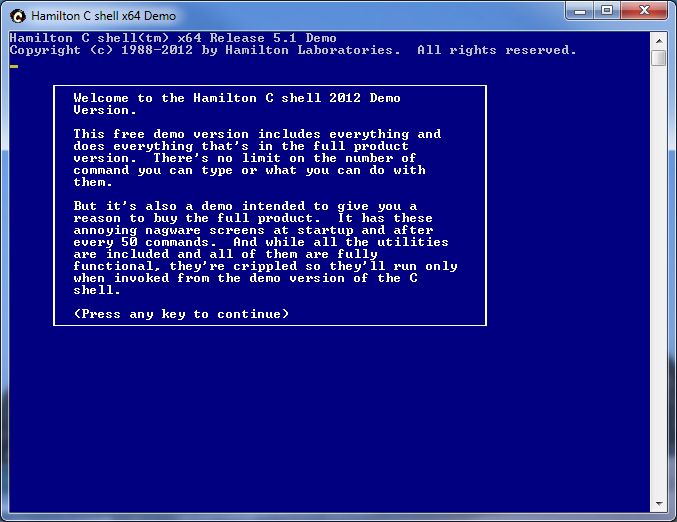 It’s free and it includes everything and does everything that’s in the full product version of Hamilton C shell. There is no limit on the number of commands you can type or what you do with them. Run million-line scripts. Read or write terabyte tar tapes. It all works. But it’s also a demo intended to give you a reason to buy a paid license. It’s not licensed for ongoing production work. It has some nagware messages at startup and after every 50 commands. 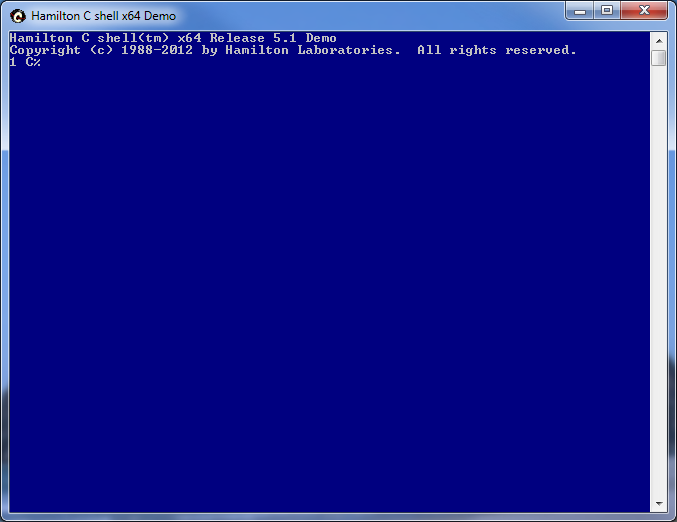 And while all the utilities are included and all of them are fully functional, they’re crippled so they’ll run only when invoked from the demo version of the C shell. No, we don’t give you a key to unlock the demo. There’s no way to un-cripple the demo version. 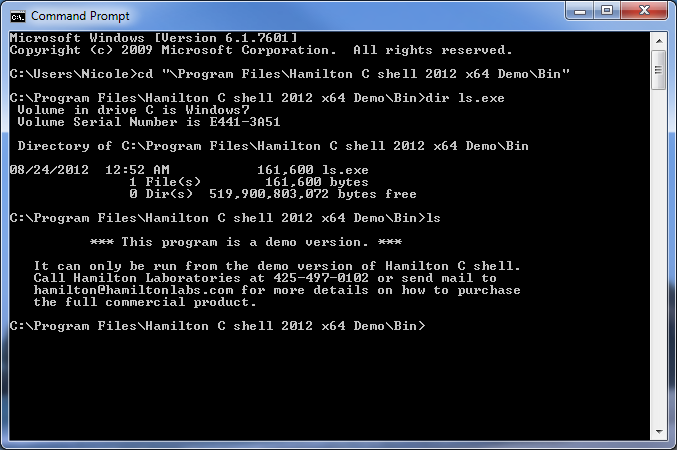 Instead, you’ll download the product as a new install file and it’ll go into its own directory in Program Files. That allows both the demo and product versions to be installed side-by-side on the same machine, which is helpful to us for testing and support. If you’re done with the demo, simply uninstall it. The demo is free but, yes, of course we support it. If you need help, have questions or if you’ve found a bug, call or email anytime. We want you to be happy with our products, even our free ones. Okay, what are you getting for free and what’s wrong with it? 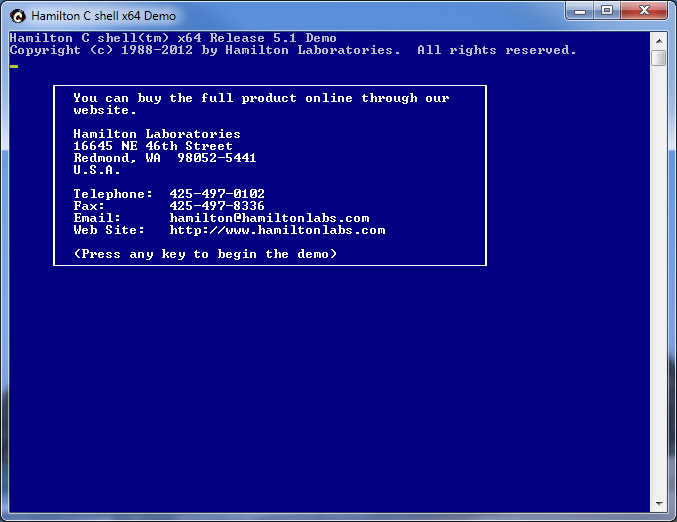 There are the 3 nagware messages you’ll see each time you start the free demo version and after every 50 commands. We have no way of making you read them. Here are the 3 messages. They go away instantly with any 3 keystrokes, as fast as you can type them. After the third keystroke, the messages go away instantly and then it’s like the full commercial product. 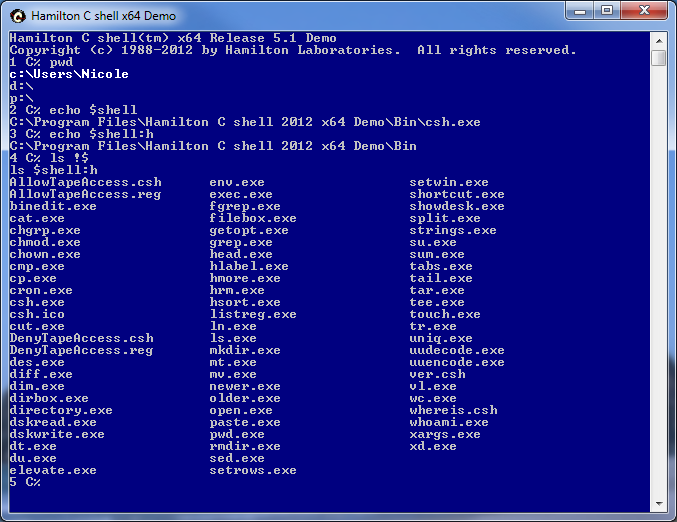 The complete C shell and all the utilities are there. You can do anything you could do in the full product and everything works. 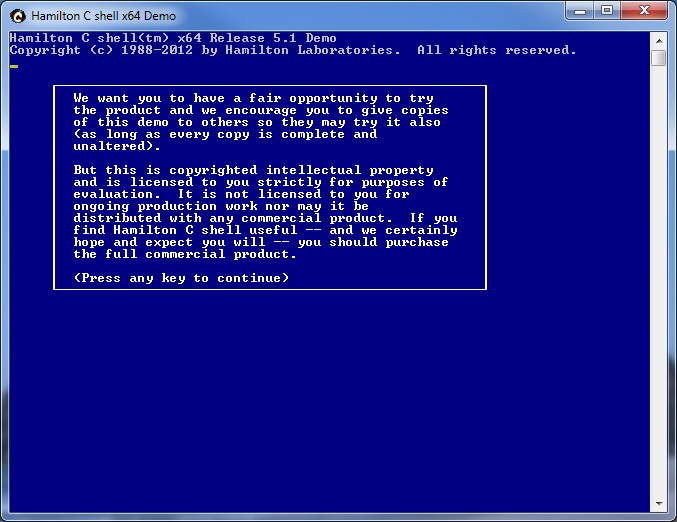 As with anything, we’re always open to suggestions on improvements to this free version. Are these nagware screens too annoying, even in something that’s free? Tell us! We care! We answer the phone and email. If there’s a way we can improve, we’d like to hear from you. We want you to be happy with our products – even the free ones.